I stared at the photos and asked myself, what would make a great title for this post? I looked closer, examined every detail and it came to me.. I looked different, in a good-glowing kinda way. If you noticed, I hardly smile in photographs. It's due to the fact that my circular face gets even rounder as I open my mouth and grin. Well that's what I think. But when I saw the photos above, I thought my smile was different, but beautiful. So with the observations gathered, I think naming this look "In Bloom" is perfect. looks I will always adore! hi, where did you buy your shoes? You're right, everything about these photos are just glowing and beautiful! 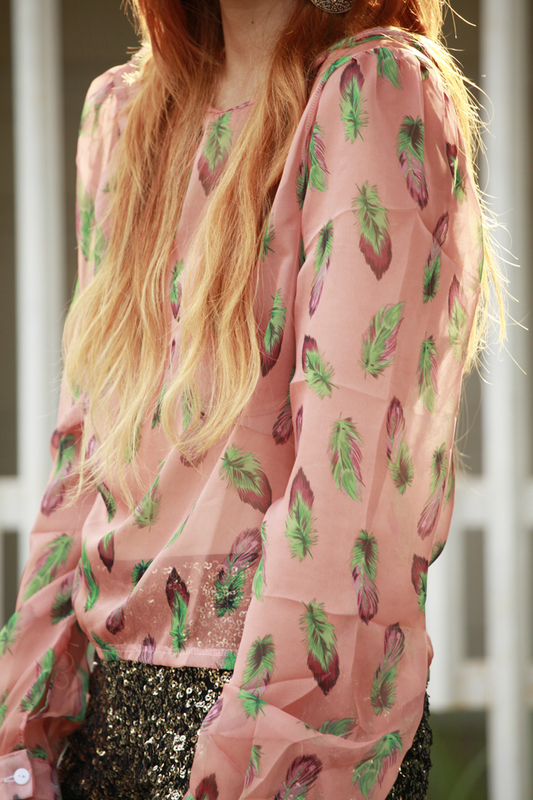 Adore the sequined shorts and pretty feather print on your blouse! i love your outfit, the whole outfit.